Let’s get right down to it, most anyone who has been around the 1911 for very long has seen about every configuration of size, bell, and whistle that has come about. This leaves one to wonder what else anyone could do to the old workhorse that is anything near to being called an improvement. The basic function and design of the gun has not changed. I think there are some features that have been improved upon about the gun, such as ramped barrels, beavertail grip safeties, undercut trigger guards and so on. I’m not a betting man, but I’m willing to wager that whoever fired the original 6,000 rounds during the Military trials, must have had small hands not to get hammer bit. The beavertail is standard issue with all my 1911’s, or the web of my right hand would be missing! 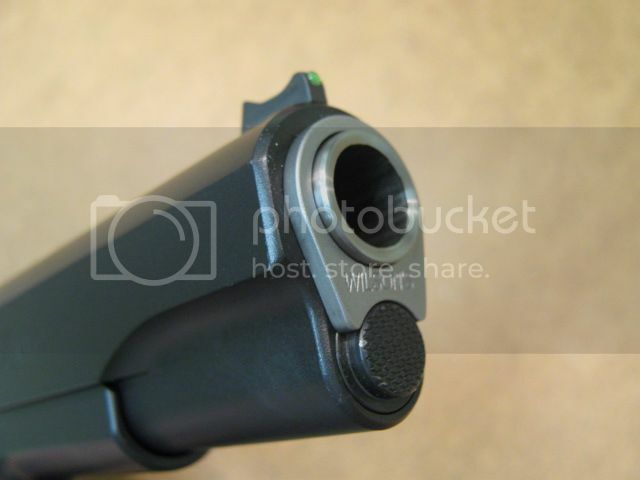 Anyone who has followed my posts and writings know I prefer a non-gimmick, basic 1911 a la Jeff Cooper, with (of course) the addition of a beavertail grip safety. 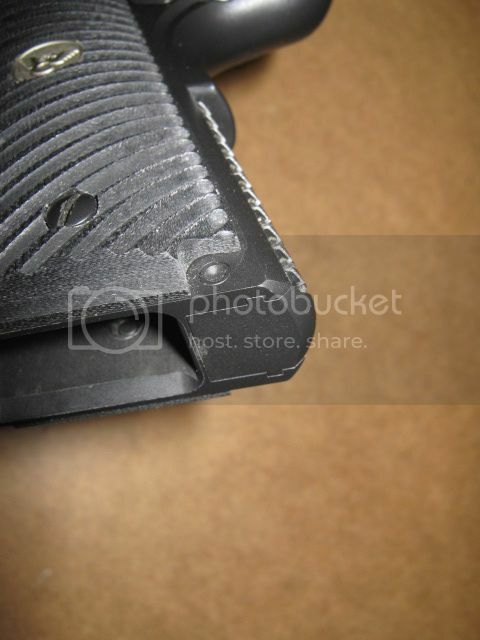 I don’t need serrations on the top, back or front of the slide, recessed slide stop pins, fancy muzzle crowns blended into the barrel bushing, or any other garb that requires a stiff brush to clean. Also, all my 1911’s are working guns, meaning they see time in the holster either on duty or in concealed carry on the street. I just can’t have a 1911 I can’t shoot. 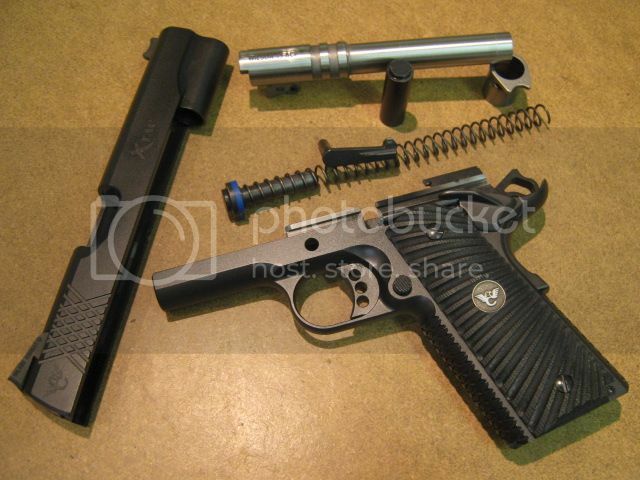 Wilson Combat’s “X-Tac” is just what I like in a 1911 pistol: quality throughout, as the boys from Berryville are known for, nothing extra that serves no purpose to the overall function of the gun, but everything one needs in a fighting pistol. The first thing one notices is the cross hatch or X pattern on the slide. I know what you may be thinking, “Here’s another gun with some fancy letters, numbers, seafood or fencing nomenclature (scallops or chain link) milled into the gun, that’s supposed to do something other than just look purty?.” Yep, the bi-directional cuts on the front strap and the main spring housing really work to help stabilize the grip. According to the short video on the Wilson Combat web site outlining the features of the gun, it’s stated that the X-Tac feature is less aggressive than a 30lpi cut. I tend to disagree, but yet agree at the same time. It does feel less aggressive, but yet I get a better grip than compared to a 30lpi cut. Since I shoot regularly with fellow forum member Jazor, I had him look it over and waited for his first words, and after handling it for awhile we came up with the same conclusion. We don’t know if it’s the X-Tac cuts, the generous undercut of the trigger guard or the combination of the two, but the gun pulls your hand into the grip like I’ve not felt before. 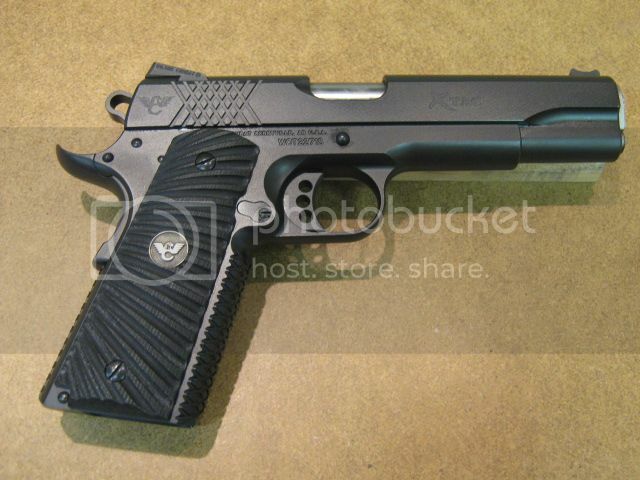 I have tried other 1911’s with the scallop, chain link, dimple, even reptile treatment, but none hold like this X-Tac. My 1911s that don’t have any treatment on the front of the grip, sport grip tape now. 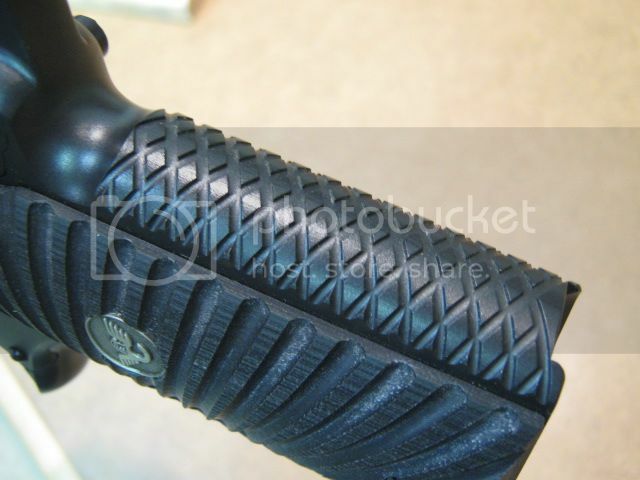 I used to prefer a smooth front strap, but now favor something that allows the hand to easily get the proper grip in the holster without hindering, yet won’t leave my hand chaffed and sore after an extended shooting session … this one allows all the above. 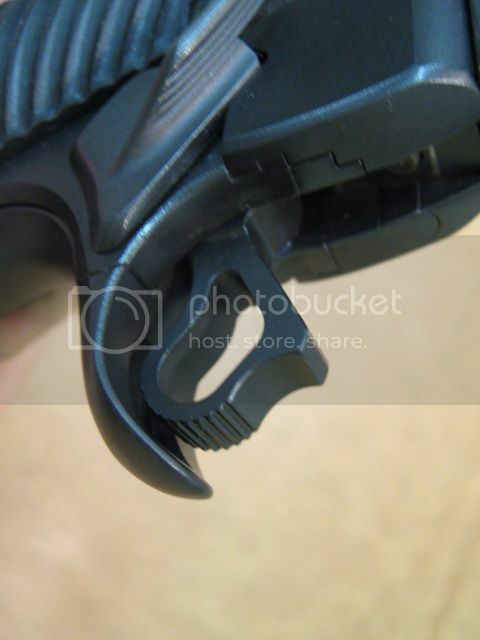 Other features or, in my opinion, “non-features” of the X-Tac: smooth, round top slide; original configuration barrel bushing/guide rod setup and take down; ledge/shelf style slide stop; slightly extended magazine release; and beveled magazine well. This gun is all business and very little bling. 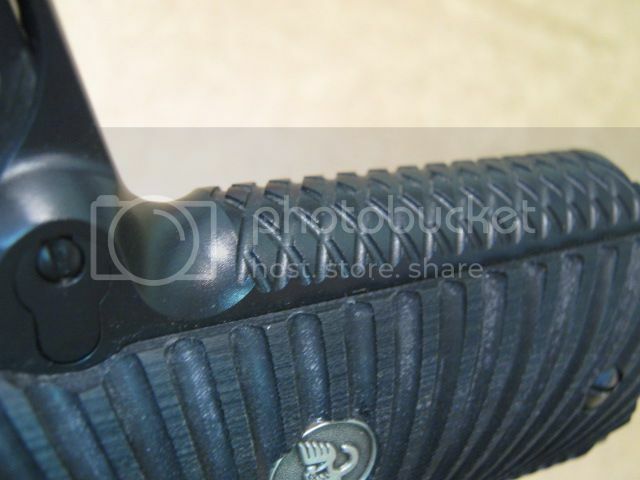 Wilson offers the option of front and rear night sights. This one is outfitted with their improved ramp, heavy-duty, fiber optic front sight, along with the Battlesight U-Notch rear. 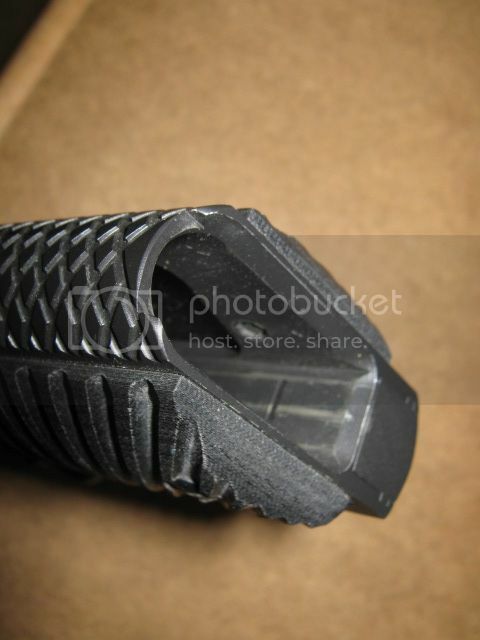 Of importance to some is the notch on the Battlesight is cut at .145”, which helps with picking up the front sight faster, as well as having a ledge to assist with one hand racking of the slide. You’ll notice I left one thing out of the description of the gun, that being the finish. 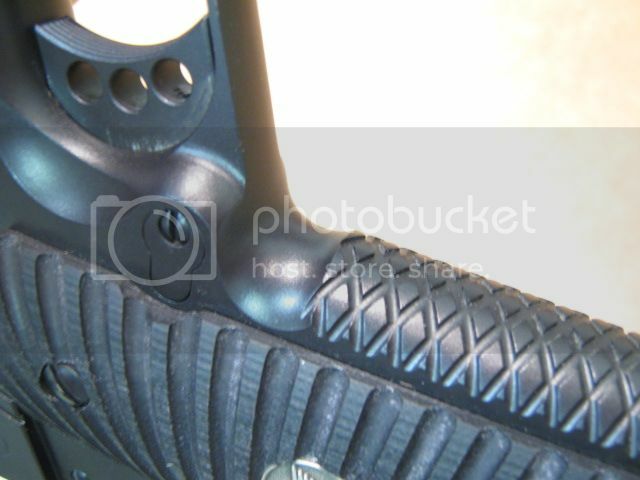 It is an Armor-Tuff finish that not only looks good but is supposed to wear well. I have been asked over the years about my thoughts of the many finishes on the market. I have at one time or another encountered most of them, but haven’t been able to see first hand how they hold up under long-term, real world use, that meaning street carry in both concealed and LE duty use. I spoke with Duane Wormington about this issue, and asked if they had any first hand knowledge of the long term wear of this particular finish. 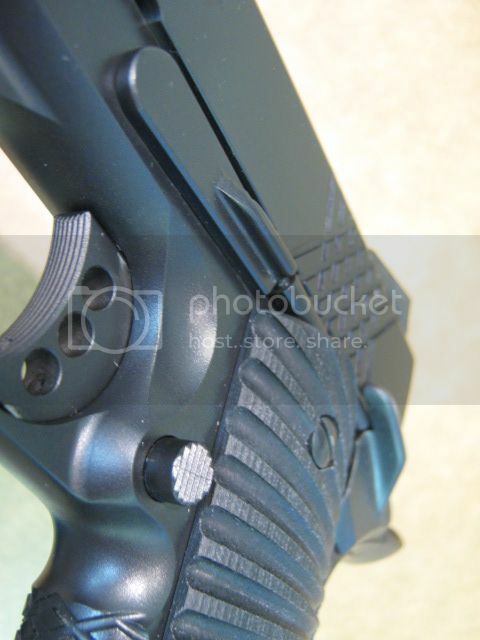 As we both agree, no finish is totally immune from wear, except those guns that are deemed “Safe Queens.” If any gun is to be used in a holster for very long, how long will it last and look reasonably good? Of course all that is subjective to how the gun is carried and used. 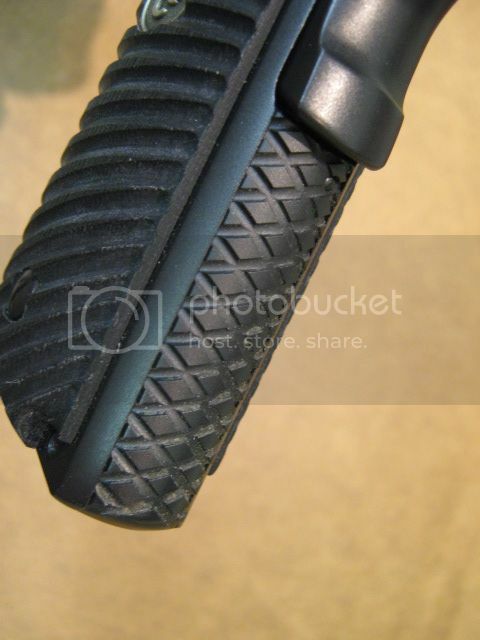 Duane said they have had very good luck with the Armor–Tuff finish, and that it shows good resistance to long term use. I posed an idea to Duane, since we test the overall quality, reliability, and accuracy of the guns here, how about a test for the finish? 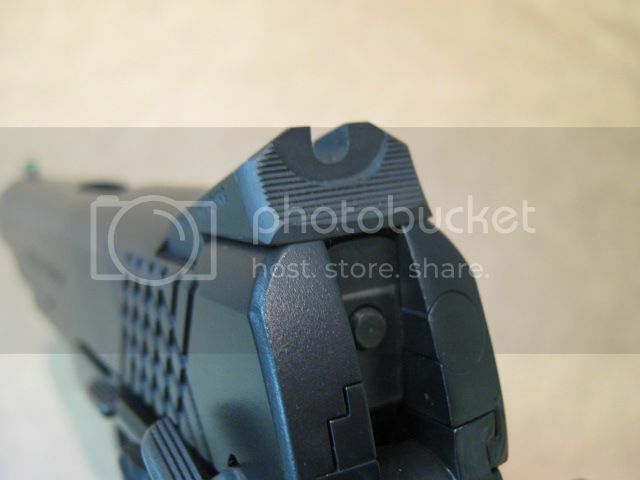 I suggested a long term real world test of the finish, where I would carry the X-Tac on duty as well as concealed carry for at least six months, giving a report with the activity of the gun along with photos of the finish every two weeks or so. The activity of the gun would be detailed as to how many holstering/draws, firing and overall handling the gun is subjected to in each of the two week increments. He readily agreed, so stay tuned for a side note thread about how the Armor-Tuff finish holds up over at least a six-month period to real world use. I put right at 500 rounds through the pistol during 4 different shooting sessions, from CQB contact distance out to 20 yards, and distances of 5, 7, 10 & 15 yards in between. Besides using a Wilson ETM magazine that was supplied with the gun, I ran my usual gauntlet of various magazines: Wilson 47Ds and 10-round; stock Colt 7- and 8-round magazines; Metalform 7- & 10-rounders; Metalform 7-rounders with the Wolff spring update; Metalform magazine bodies with Wilson’s 8-round conversions; and three other unknown oddball makes of magazines that have given other guns problems, along with nine different types of rounds, +P included. With the combination 17.5-lb. recoil & 19-lb. main springs, along with the original design, small-radius firing pin stop, this gun recoils straight and true, allowing me to get consistent accuracy with fast follow-up shots and multiple round strings. Even with +P ammunition, there was no felt torque in the hand, and the gun tracked like it should. I was able to run a good mixture of ammunition specimens through the pistol, most of which are currently available. Since I know many of you carry a variety of currently available defense rounds, I try to include those in my testing. However, there are two benchmark rounds that seem to have a reputation for jamming, Speer’s 200gr Lawman aka “The Flying Ashtray”, and Cor-Bon’s 185gr flat point HP. Every time I find these rounds, I always grab them just for testing purposes. I put 50 rounds of each through the pistol using the above different magazines, and did not encounter even a slight hesitation. Other ammunition used was: Remington’s Golden Saber, Federal's HST & Hydra-Shok, Speer’s Gold Dot, Winchester's SXT, Winchester USA ("white box") ball (FMJ), and a specimen of my reloads, 4.5gr of Bullseye loaded with both a plated and lead 230gr round nose bullet. Through the 500 rounds of various makes listed above, I never had one malfunction, or even a hesitation. With all Wilson Combat Pistols comes an instruction manual, and there’s a section about ammunition, that which is recommended and some to avoid. I didn’t have all specimens listed, but I certainly didn’t shy away from those rounds they state to avoid. Like I said before, I didn’t encounter one malfunction with the gun, nor as much as a hesitation. 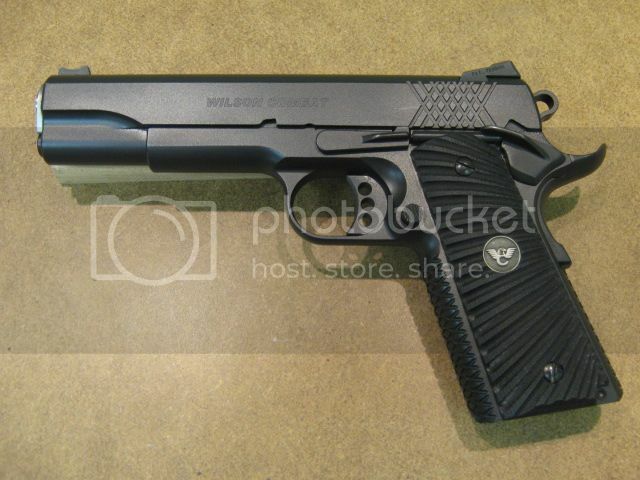 Although the X-Tac is Wilson’s most inexpensive pistol they offer, save one 9mm model, I would put this gun up against those costing hundreds or even thousands more. The function, reliability, accuracy, and quality throughout tell you it’s a solid 1911 pistol; the price tells you it’s a guaranteed bargain! There are production guns on the market that have nowhere near the hand-built quality this model does, yet cost only a few hundred dollars less. 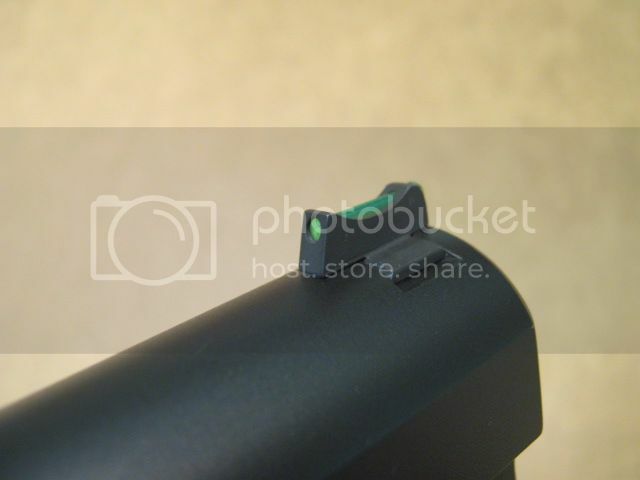 For a 1911 pistol in the “Semi-Custom” class, I can’t see anything coming close to the value of the X-Tac. I know some may not like the looks of the X pattern on the slide and frame, but I think those may change their tune once they get it in their hands and run some rounds through it. If you’re looking for a solid built, quality 1911, with little frills, I really suggest you take a look at the X-Tac, it will not disappoint. 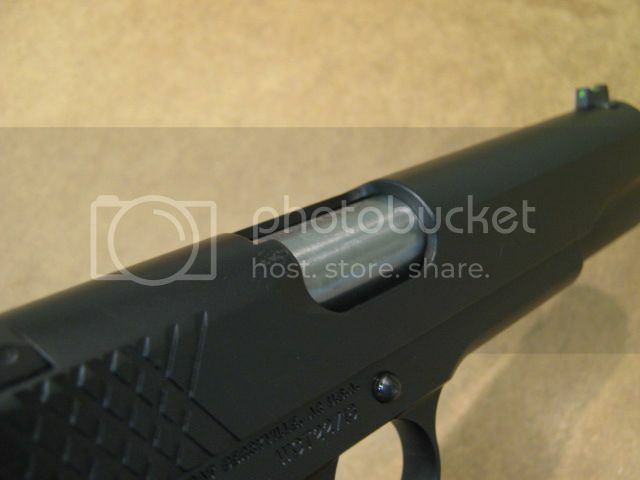 You may discuss the pistol in this review, in this discussion thread, in our Forums Site.